Many Americans are in an “It depends” frame of mind when they consider a central trade-off of the digital era: Will you share personal information in return for a product, service or other benefit? A new report from Pew Research Center explores six different scenarios where Americans might encounter that privacy-related question. It finds that people consider a variety of things in making their decisions, such as the value of the benefit they are being offered, the circumstances of their lives, how they feel about the organization that is collecting the data, what happens to their personal data after it is captured and how long the data are retained. This report builds on other recent Pew Research Center survey results showing the emotions Americans feel as they struggle to understand the terms that govern sharing personal information with companies. 2There are very few devil-may-care people who are eager for every bargain involving personal information. 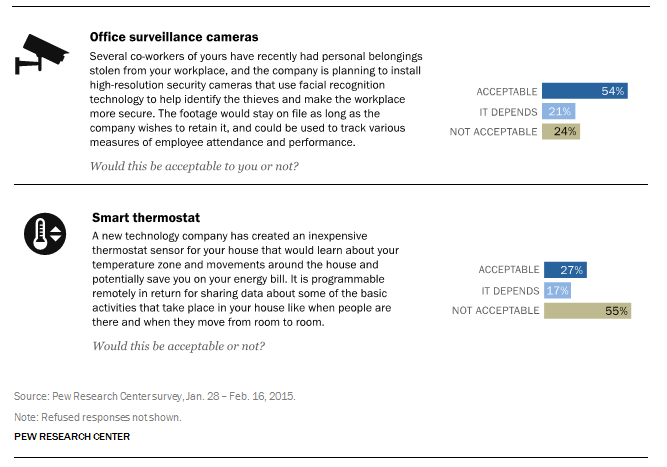 One-in-six adults (17%) would not take any of the deals in the scenarios and only 4% of Americans said they would find all of the six scenarios “acceptable.” A substantial majority indicated they would accept at least one of these transactions — which, in addition to surveillance cameras and smart thermostats, included privacy trade-offs involving retail loyalty cards, auto insurance and free social media. Taken together, these findings are an indicator of how Americans’ views are very contingent on the context of the deal. 5Many focus group participants were uncertain, resigned and annoyed – or worse – with the current state of affairs regarding privacy. At the same time, some accept that this is part of modern life and others hope technological and legal solutions can be found. In the focus groups and open-ended responses to survey questions, though, people are often much more likely to speak of the darker side of personal information trade-offs than they are to cite the benefits.